As much as I love Christmas (and as I’m sure you’ve gathered from my several posts on the matter, I really do love it) I rarely celebrate in a very traditional way. Family is always someone else’s or none at all, presents are never exchanged on the 25th, and for most of my life there wasn’t even cold weather (which I think is a total Christmas buzzkill). 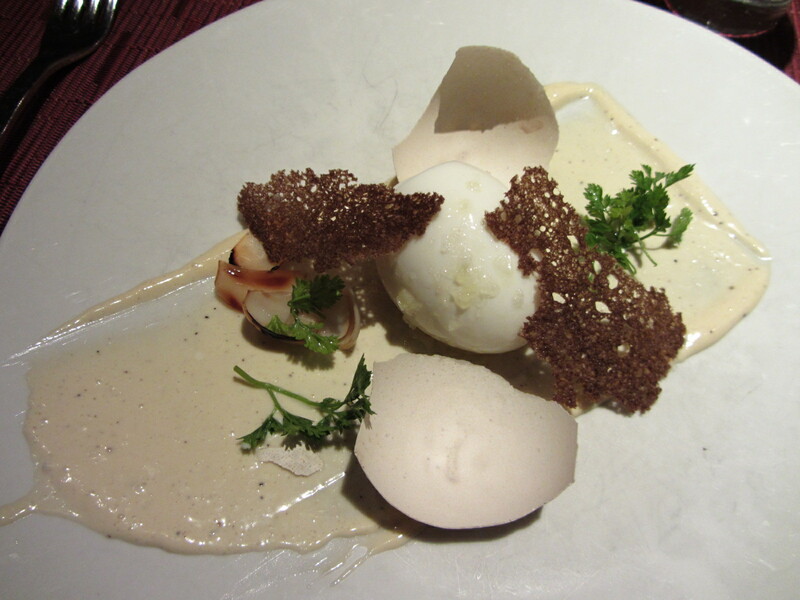 This year, in keeping with my tradition of nontraditonal celebrating, I convinced Flaneur to pass on Christmas hams and comfort food for avant-garde American instead with a holiday dinner at wd~50, the LES restaurant from Wylie Dufresne. As first timers, we went with the tasting menu, an 11-course trip through a crazy menu with lots of surprises, interesting presentations, and big flavors. 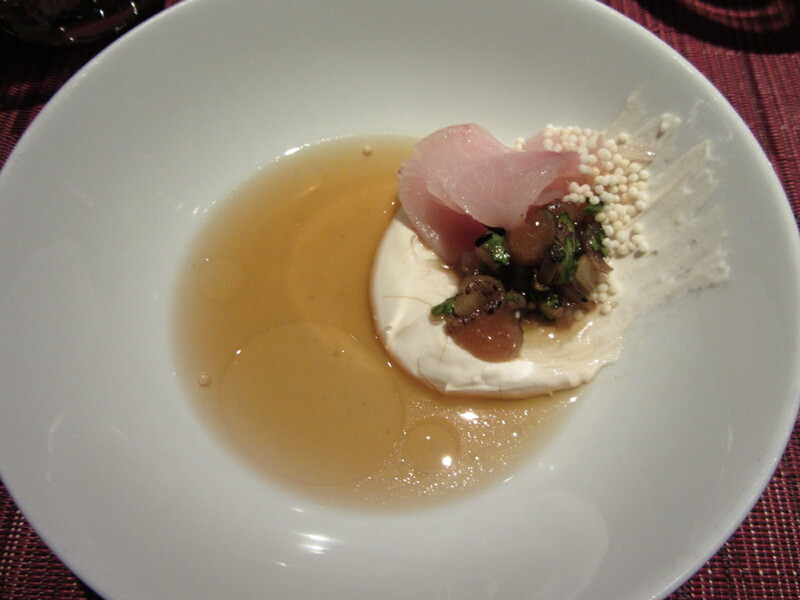 First out, an amuse bouche of hamachi, marcona almond, ginger, and oolong tea. The different texttures and consistencies definitely amused my bouche. 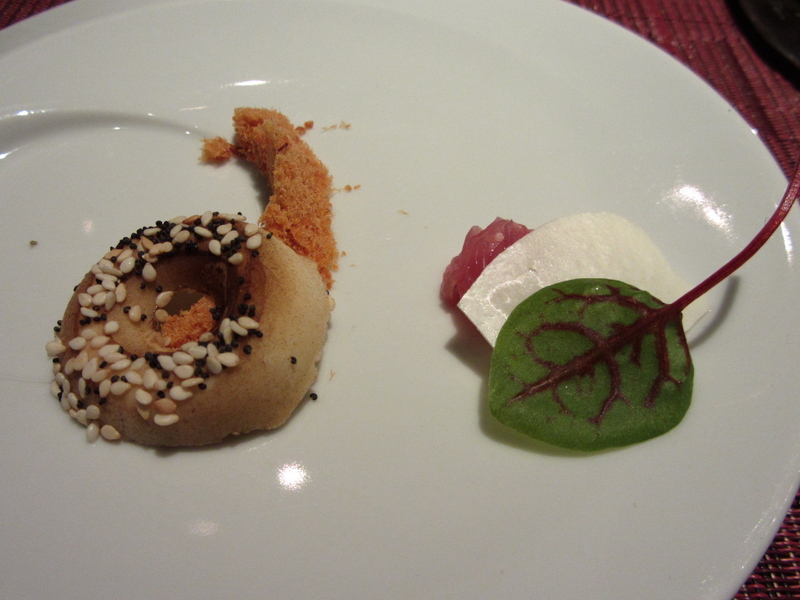 Next, one of the most clever dishes of the evening, an “everything bagel” with smoked salmon threads, and thin, crispy cream cheese wafer of sorts. The “bagel” was really made out of ice cream, making for a pleasant shock on the tongue. 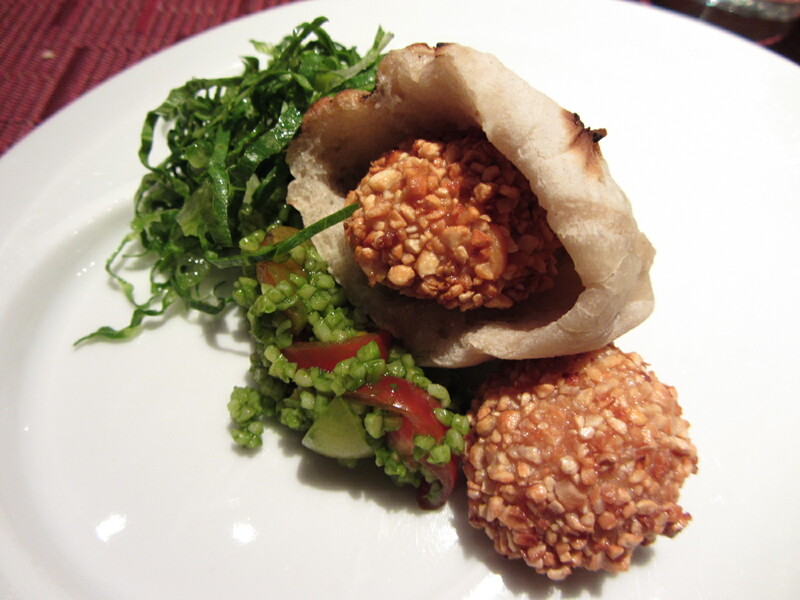 After that, another appetizer, the foie-lafel, a super tasty, delicious take on a falafel. 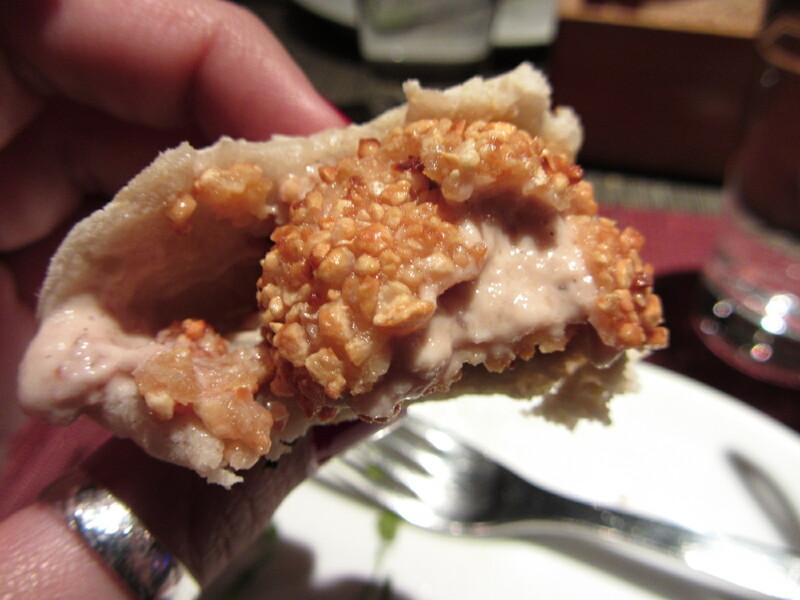 Instead of fried chick peas, the mini pitas were stuffed with fried balls of liquid foie gras. So delicious and crazy, you just have to laugh. Each bite oozed warm foie gras and it just really doesn’t get better than that. 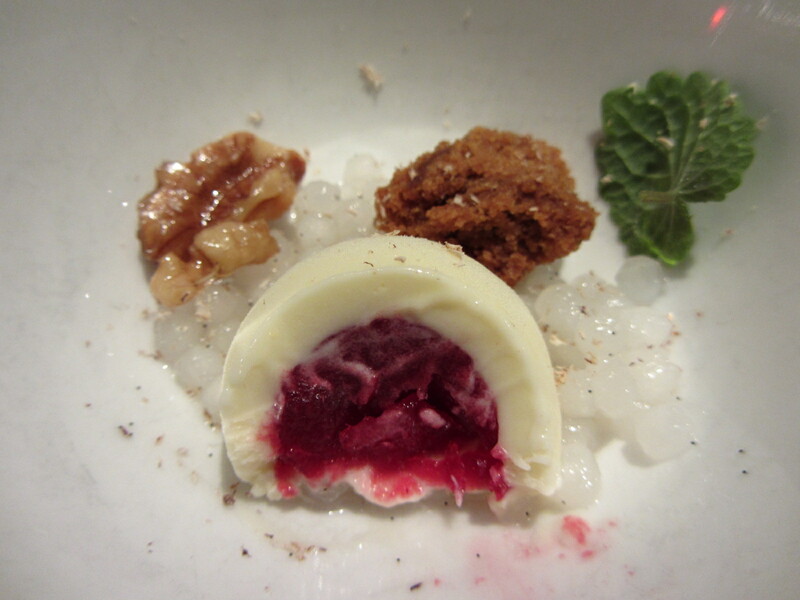 Next, a poached egg in the shell (which by the way, was edible! 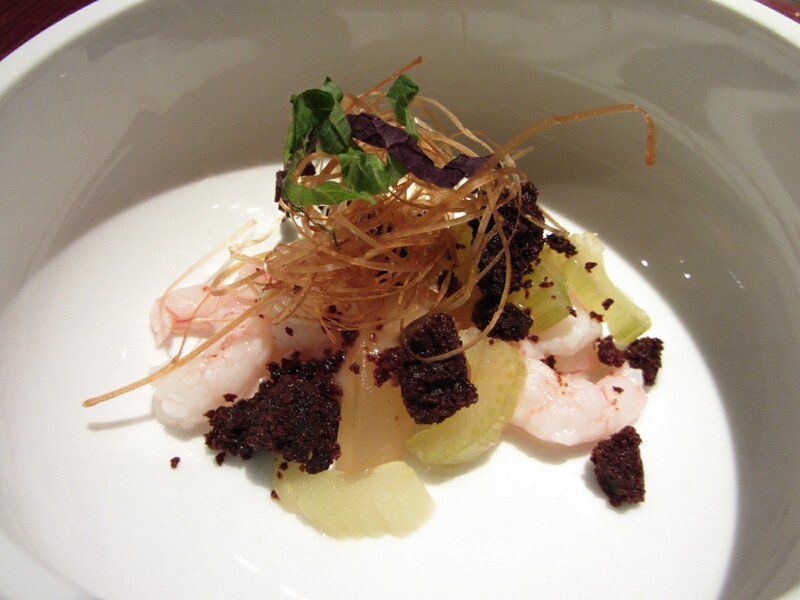 ), crispy thin pumpernickel crisps, a thick, creamy caesar dressing and bean sprouts. When I poked into the egg and yolk burst out, I did a little dance in my seat. 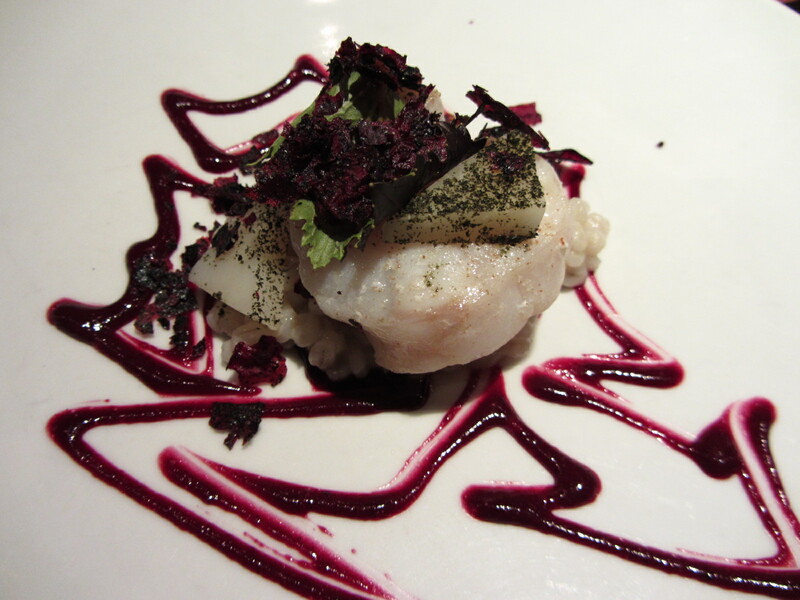 After came the monkfish with smoked barley, beet-mustard, and nori. I’d never had beet-mustard before but if the supermarket carried this reddish-purple, spicy condiment, I’d definitely buy it. 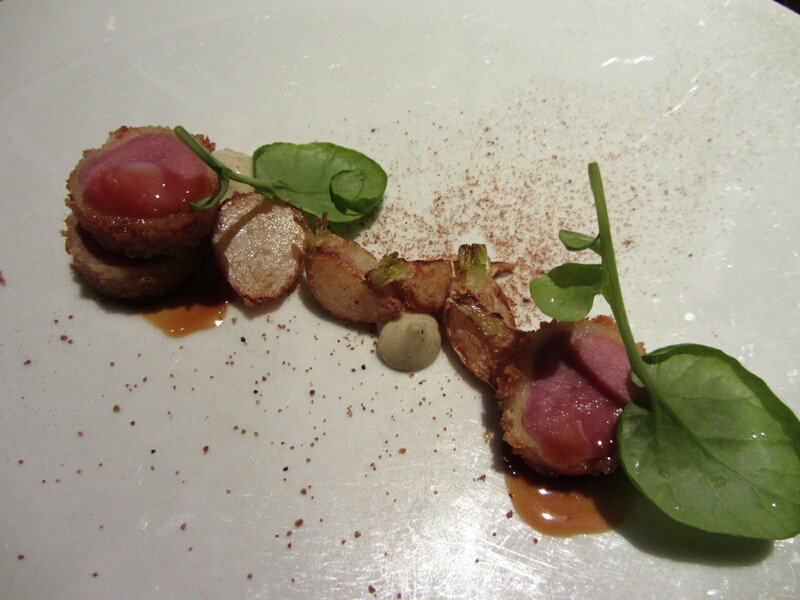 Moving away from the seafood, we next had plump bites of juicy quail with chartreuse yogurt, turnip and nutmeg. The red meat portion of the evening came via lamb loin with ‘red beans & rice’ and chayote squash. 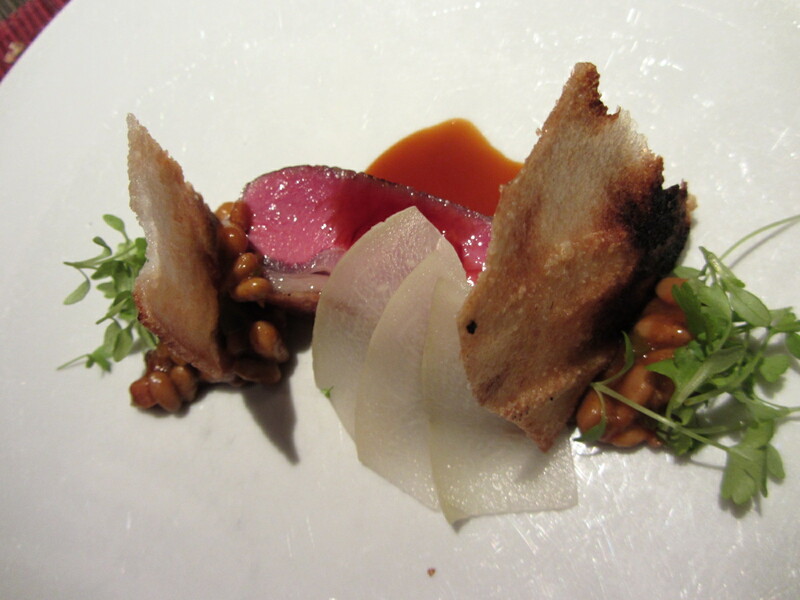 With it’s rich, earthy flavors, this was a favorite. In between the savory and dessert dishes was this little palate cleanser, the bourbon, cranberry, gingerbread, and walnut. The crunch of the gingerbread and the nuttiness of the walnut were the perfect opposites for the softer round cranberry ball. Being the holidays, I appreciated the cranberry and gingerbread flavors. And then finally, the desserts. 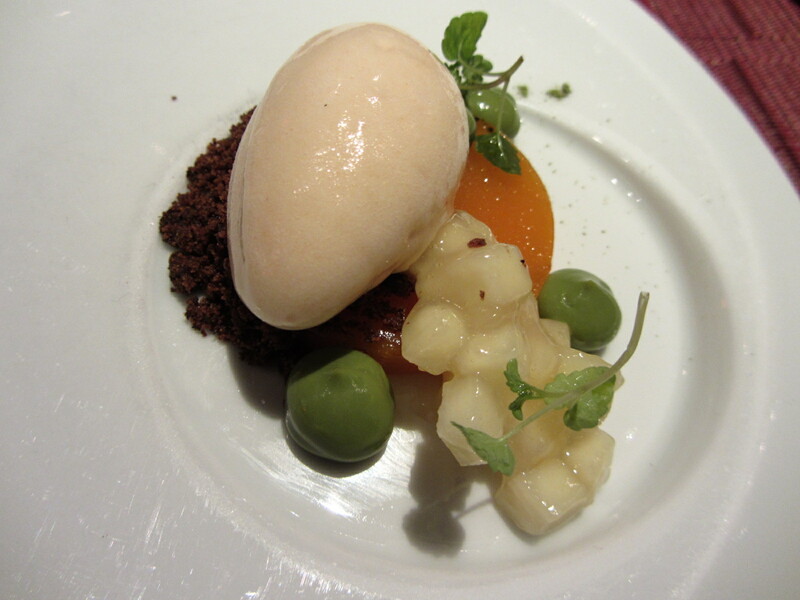 First out was the apricot, buckwheat, quince, and green tea. Soft, creamy ice cream on a thick, compote-like dollop of apricot. What looks like peas in the picture were actually smaller dollops of a dense, smooth green tea cream that was delicious with the really bright, colorful flavor of the apricot. Next was the dessert that I liked the most because it reminded me of the meal I had so many times growing up, the national dish of brown people: rice and beans with a side of plantains. The flavors were milk chocolate, black bean, plantain, soy, and peanut which gave this a really earthy, nutty, interesting flavor for a dessert. My favorite was definitely the glob of ice cream, which was cold and creamy but was packed with—wait for it— plantain flavor! 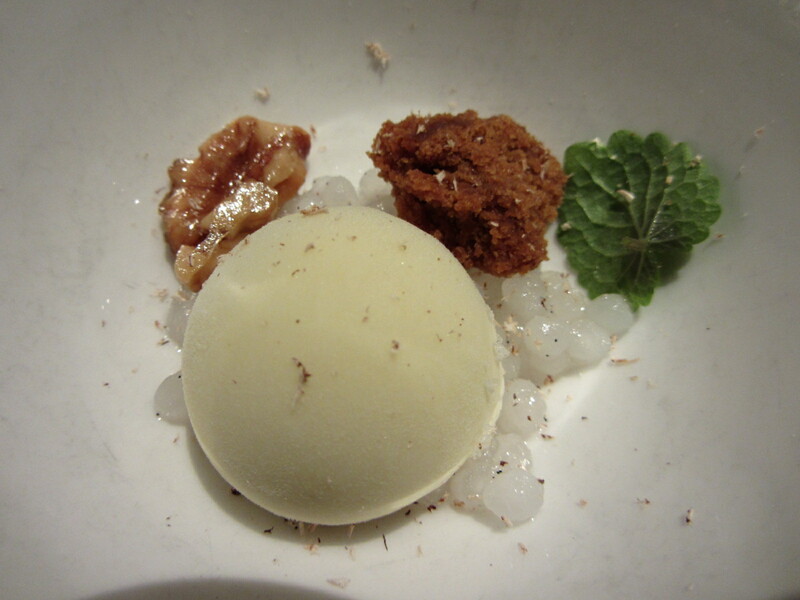 Last but certainly not least, were the wd~50 spin on Rice Krispy treats. The first were super cold, marshmallow icream coated in Rice Krispies. 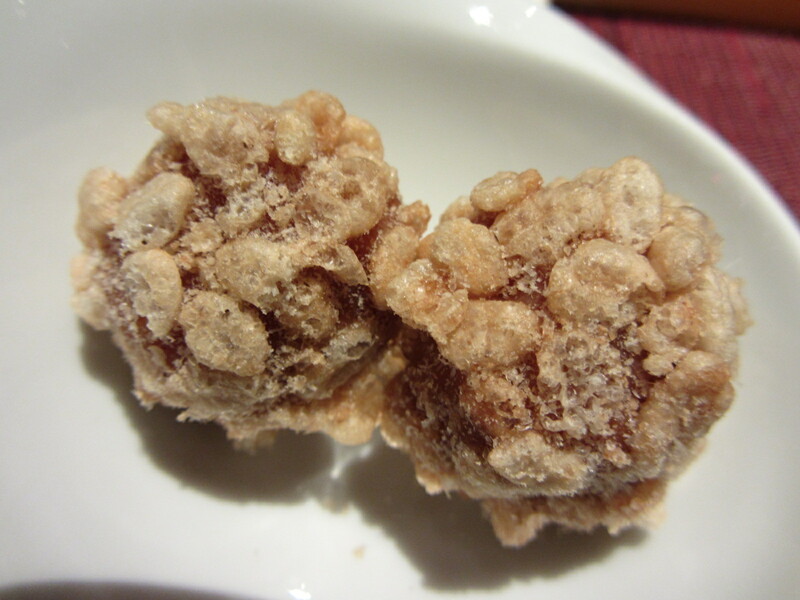 Cold, crunchy and sweet, I would love to have a bucket of these at the next movie I go to. 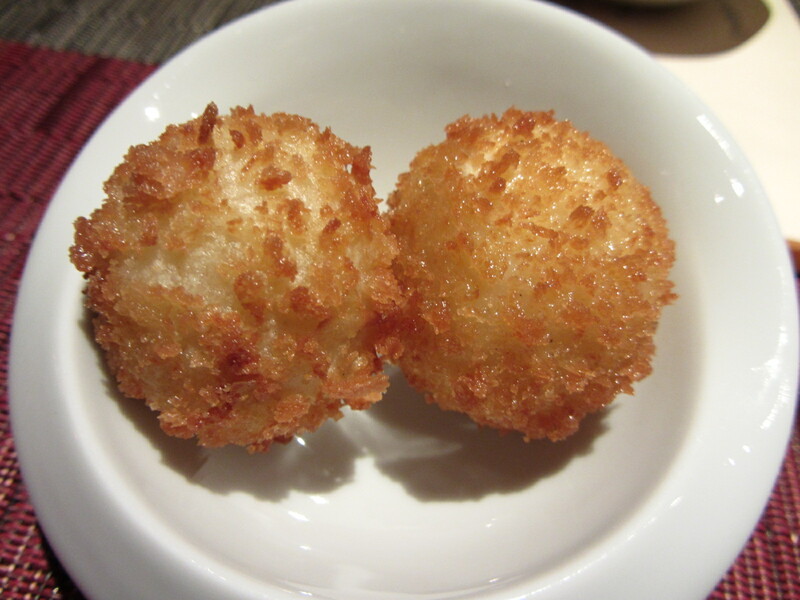 The other balls (hee hee hee) were actually fried rice pudding, which were soft and warm on the inside and oozed something that tasted like orange liqueur. Not entirely sure if that’s what it was but it was goooood. It wasn’t a traditional Christmas dinner and it wasn’t even on Christmas, but the food was great and the company even better, and that’s all I needed to have a merry Christmas. Hope yours (or whatever you celebrate) was good too! 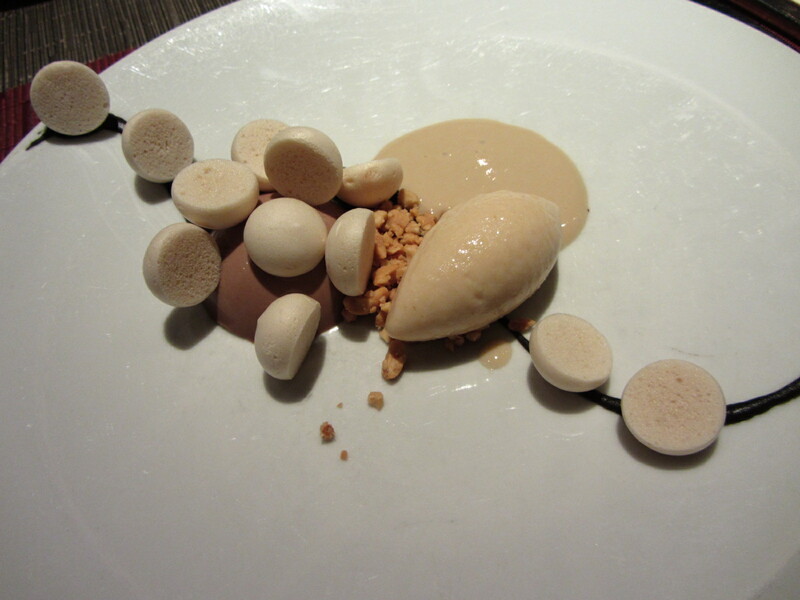 This entry was posted in Dinner and tagged holidays, Lower East Side, molecular gastronomy, wd~50, Wiley Dufresne. Bookmark the permalink. ← Eggnog almonds save the day!